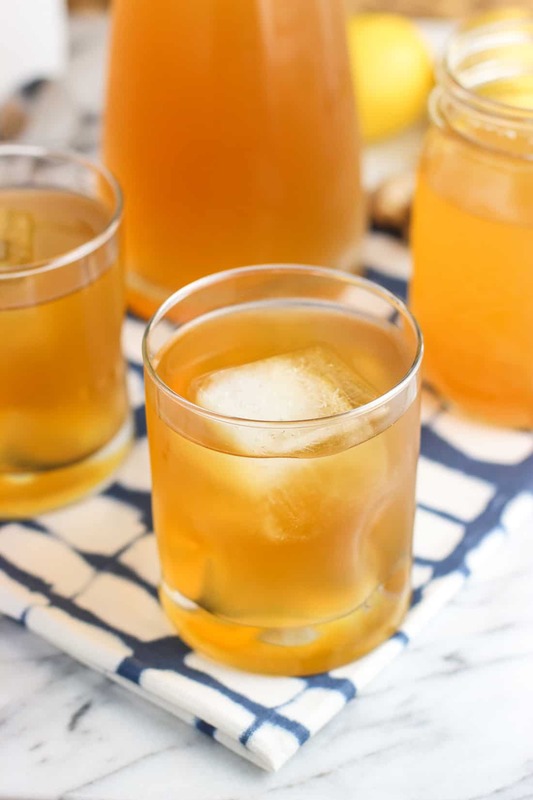 Lemon ginger iced green tea is a refreshing twist on a favorite summer drink. 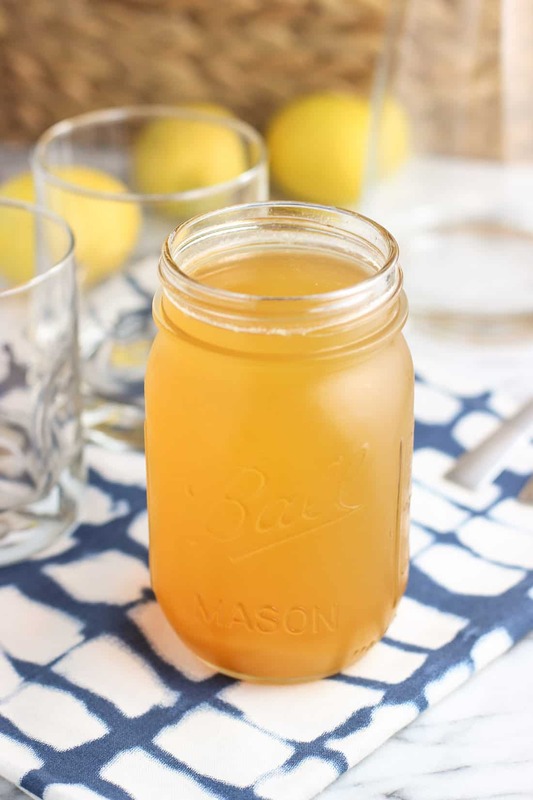 An easy lemon ginger simple syrup uses honey to flavor and sweeten multiple batches to your liking. How’s that for a title? I suppose it makes this iced green tea sound more complicated than it is, which isn’t exactly what we want. 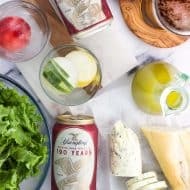 This iced tea happens in two parts – first you make a slightly-fancier-than-most simple syrup, and then you brew up some green tea. Combine the two in your preferred ratios and that’s it! Serve over ice. Easier, zhushed up iced tea. And MAN oh man can I say that anything easier is much appreciated these days. Setting up a house is no joke. All the painting is one thing, but choosing furniture? Impossible. We have a couch picked out (and that’s it), but how in the world are you supposed to pick out a rug? After hours of online shopping, I’ve determined I’m a rug Goldilocks over here, except for the fact that I haven’t yet found the one that’s just right. Needless to say my brain has been filled to capacity with things like trying to remember to sign up for garbage service and ripping a chair rail off the wall without causing a ton of damage in addition to the usual work/blog/life culprits, so the blog has been a little quiet lately. But that changes now! 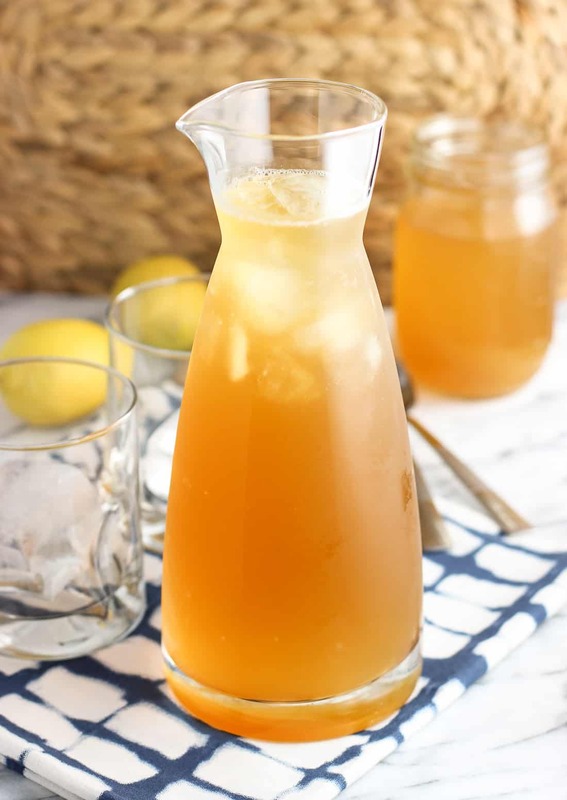 I can speak from experience when I say that this lemon ginger iced green tea with honey totally hits the spot when you need a little warm weather pick-me-up. To be more specific, it especially hits the spot when it’s 90 degrees F outside and your paint drop cloths are covering the vents so you can’t turn on the A/C. Oooof. 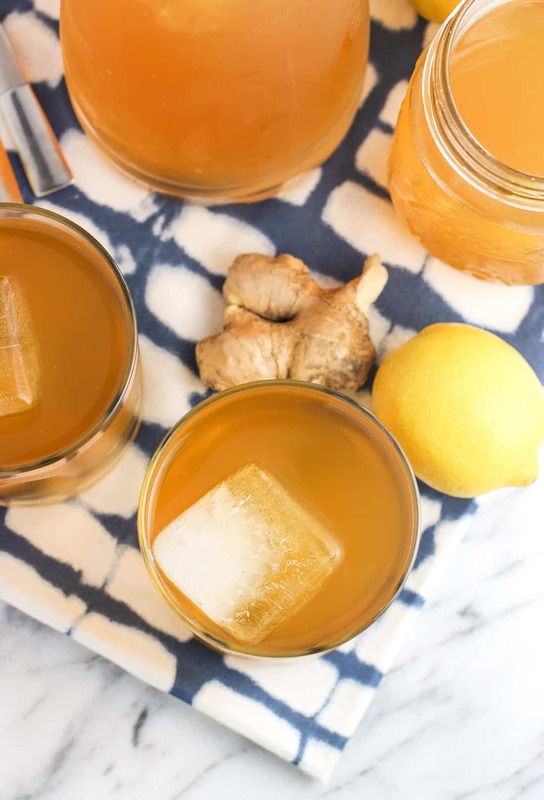 Let’s talk this lemon ginger simple syrup! 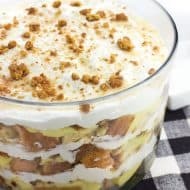 It’s made with a mix of granulated sugar and honey for sweetness with a little flavor. 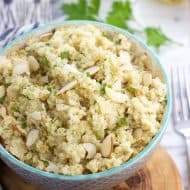 Once the water/sugar/honey mixture comes to a simmer and the sugar granules have dissolved, you’ll remove it from the heat and add lemon juice, lemon peel, and thin slices of fresh ginger. 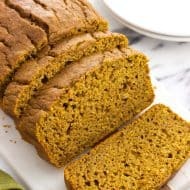 The flavor will infuse as the mixture cools, and once cooled completely, you can pour it through a strainer and refrigerate. Stir together water, granulated sugar, and honey in a medium saucepan set over medium heat. Let it come to a simmer. Once sugar has dissolved completely, remove from heat and add ginger, lemon juice and lemon peel. Stir, and let syrup cool to room temperature. 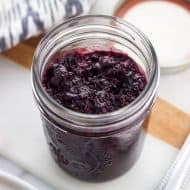 Once cooled, pour syrup through a strainer to remove the ginger/lemon peel and store in an airtight container in the refrigerator. Bring water to a boil and let tea bags steep for five or so minutes (your preference). Refrigerate. Add your desired amount of lemon ginger syrup to iced green tea. I suggest 1/2 cup of syrup to 6 cups of tea for a flavored and sweet but not too sweet twist. Of course adjust the syrup to your liking! This recipe yields approximately 1 1/2 quarts of iced green tea, which I'm calling 6 servings. Nutritional info is an estimate based on using one-quarter of the lemon ginger simple syrup in 6 servings. 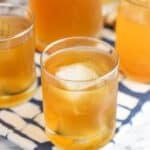 You should be able to get 24 servings of this iced tea out of one batch of simple syrup, but will vary depending on how sweet you like your tea. Here are some other summer favorites! It sounds like you are both staying busy with the new house! Hopefully things will start to settle down soon for you guys. In the meantime, this looks like such a great way to enjoy some green tea. Love the idea of using a lemon ginger syrup! I can’t wait for that day! We’re so excited for the little things we’ve been missing, like having a grill, a fenced in backyard, and more than two rooms! haha Thanks Danielle! You sound so busy, and picking furniture and decorations for the walls is no laughing matter! I still have a few empty spaces on my walls after 14 years because I’m looking for something that’s “just right”. 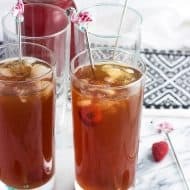 🙂 This iced tea sounds like the perfect way to cool off — these flavors sound so refreshing! I know what you mean – “just right”! I tend to want to do everything right away, so this whole house thing is making me practice my patience (that’s for sure!). Thanks Marcie! This sounds lovely! I have been all about everything iced! Iced coffee, iced tea….so needed!